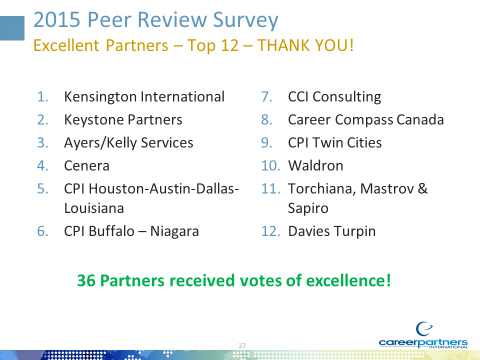 Career Compass Canada is recognized for excellence by a peer review ranking process, placing in the top 12 for Excellent Partners out of 72 global Career Partners International firms. The 2015 Peer Review Survey is based on: Partnership, Responsiveness, Fees, Information Shared, Direct and accurate communication. This was announced at the CPI AGM. “I received competing job offers after going through a 3-month coaching program with Stephen. His approach is highly programmatic. Each session has been designed to elevate my knowledge and skills to the next level. As we progressed in the program, I started to receive an increased number of responses and interviews. And later on through mock interviews, my interview results were also significantly improved. Nance, “ thank you for being such a positive person, thank you for always believing in me and for always keeping me grounded. You are an amazing professional with a very kind heart. “Hi Melissa: I just wanted to write you a brief note to say how great it is to work with you. The service and support provided by Brian was very helpful for my career re-positioning and options evaluation. I was in a unique career change position where Brian and I focused primarily on assessment and re-evaluation, overall resume restructuring and networking. His provided tailored-made strategic approach for my case. I would like to take this opportunity to thank Brian for being understanding, supportive and patient during the entire process. “I recently completed one month of career transition with your firm and was assigned to Aline Ayoub. I wanted to take a moment to share with you that Aline was an excellent transition partner. Aline was professional and detailed, she was a woman of her word regarding feedback and exchanges of information with me throughout the process. Moreover, Aline took the time to work with me in a way that made me feel like a valued client. Her guidance was extremely helpful and tailored to my specific search challenges, opportunities and needs. “I started my new position as Regional Marketing Manager. The role is a really good fit for my skillset and I am happy because this is a great career opportunity. Thanks for your one on one Q&A coaching sessions. It really helped me prepare for my interviews. I would recommend the consultant that I had (Aline Ayoub). I found her to be very helpful in providing me the right guidance, direction and suggestions that I needed during this process. Executive coaching with Nance was a substantial component of me driving dialogue about change in roles. It also helped me re-focus on taking charge of my choices and drive forward, regardless of obstacles. Ie: Focusing on what I can influence… both in terms of not letting the periphery be as distracting and disappointing. While I don’t think my performance was suffering in the previous role (and feedback from my manager was always that I was a high performer), certainly I believe I can influence more in my new current role, and am therefore happier. This can’t help but be good in the long run. There have been a number of times after coaching that I have gone back to the office and taken another try at something that I thought was un-moveable, … and moved it. The coaching process is very powerful and I am grateful to have been coached by Nance and will definitely call on her expertise again. Nance, I start a new job tomorrow as a Facilities General Manager in Toronto. Thanks for your help with coaching and the resume. Nance, Thank you for all your assistance with my employment search. Your help has given me my new job.. I wouldn’t have landed something, @ my wage & benefit expectation without you. Thanks again! Julia, It was very nice to work with you too and I really appreciate the personal touch you give to it all. I’m of course happy to complete and survey and provide feedback. You should know that since making those few changes to my resume we discussed on LinkedIn (and the webinar tips) that I’ve been contacted by at least 6 different recruiters in the last week alone so you can let other candidates know that it does work. I got the right help at the right time. I only wish I was able to start with you earlier. Looking for help when you are job searching can be a daunting and difficult challenge. Many individuals in this position are often feeling afraid, vulnerable or may be in a time of crisis. I was so fortunate that I chose Career Compass Canada and had the opportunity to work with Joanne Echlin. The program itself is so comprehensive, it covers every single aspect of the job search process. The program is completely geared to each individual’s needs and situation and there is help every step of the way. There is professional assistance with resume writing, LinkedIn profiles, interview preparation, there are webinars to view and questionnaires to complete that assist individuals in determining what their strengths and interests are, leading to your desired future. However, the real difference at Career Compass Canada is in the people who work there and provide the ongoing support. Joanne Echlin is one of most intelligent, caring, compassionate and professional people I have ever met. She has the amazing ability to really understand people and she does so with such a kind and supportive manner that you really feel like you are important and understood. She makes you feel like anything is possible. She is so flexible and allowed me to be fully in control of my journey,yet she kindly encouraged me when I needed it the most. She always went out of her way to assist me and was always available if I needed her. While this was never my intention, not only did Career Compass Canada help me, but they also assisted my son with finding his dream job! Al Lutchin went above and beyond my expectations by offering my son an opportunity that is a testament to the values and support provided at Career Compass Canada. They really care!! I would recommend this organization to anyone who is looking for assistance in the career search process. You will feel valued and supported every step of the way and the program itself will provide you with all the tools you need to be successful. Just having Nance as a sounding board, helped rebuild my confidence. This was an excellent learning experience for me. I gained new knowledge, and discovered more about myself than what I had known previously. The meetings were very flexible, and I was able to participate in the sessions from home. My coach was very open, and supportive with me throughout all my sessions. I would not hesitate to recommend the services of Career Compass Canada to anyone in the same position as me: unemployed, and looking for the next transition. This program and Laura’s guidance were a great set of skills. This was far more valuable to me than a program I had several years ago with a different outplacement firm. I feel empowered with a system and set of tools to help me secure not just a job but the right job for me at this time in my life. Laura did a super job of helping me accelerate from unprepared to confident and empowered in a very short time. I believe I will enjoy lifelong benefits from this program. After making the difficult decision that our organization would need to undergo a restructuring, we partnered with the team at Career Compass Canada. From the initial point of contact, we knew we had found the most professional and highly invested outplacement firm available. 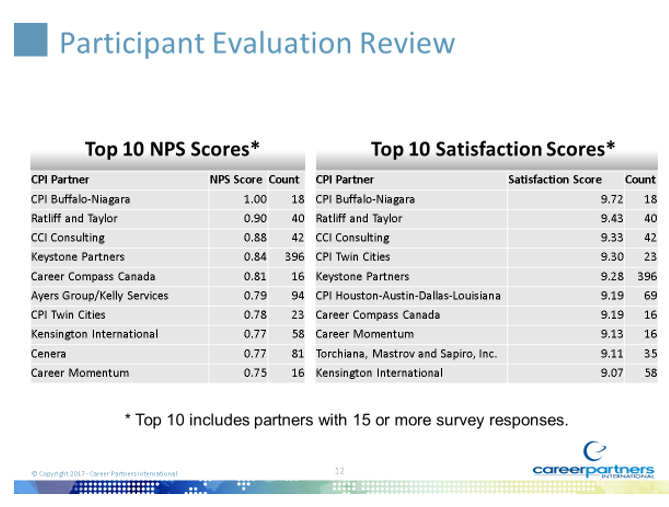 The restructuring affected six cities in North America, and through the Career Partners International Network, the team at Career Compass Canada mobilized partners in 6 cities internationally. The support that was given to the HR department, managers involved in the termination process, and most importantly the affected employees was caring and thoughtful. The program itself was met with a high level of appreciation and has been incredibly successful. As an Employer we are able to feel like we are supporting transitioning employees during a very difficult time. I was very impressed with the team at Career Compass Canada and owe them a tremendous debt of gratitude for helping us and our employees during a difficult time. Thank you thank you thank you. Just a note to let you know I have landed a transportation position with a chemical producer / distributor in Toronto. I am especially thankful for your time and expertise you provided to me through this transition. I would like to think the improvements to my resume you suggested as well as some of your guidance regarding LinkedIn profiles and interviewing tips made the difference. She is very professional and so easy to talk to and I felt very comfortable discussing about my present and future plans to determine what I really want to do. Furthermore, she has also helped me in writing a great personal resume. I am very thankful to have been assigned Sabrina during my career transition, she is a wonderful coach! Al, I appreciate all the guidance and support when I was initially laid off. While Real Estate may have come to the surface later during my unemployment, staying positive and getting through those first 6 months is really what led me here. Thank you for being there. I am happy to have had the past six months to look at so many pieces of my life and to grow and learn so much. I can’t thank you enough again for your support during my process. You truly were and are a positive influence in my life when things seemed confusing and difficult and I thank you for that. I will not ever forget you. Working closely with an experienced and knowledgeable consultant who is able to guide you through the career search process was a tremendous help. A very positive and supportive environment, and staff are both professional, friendly and easy to work with. My consultant was very accommodative of my time and priorities and was always available when I needed her. Words cannot express how grateful I am for all of the help and support you gave me to start my new career! I am pleased to inform you that I have secured a position with a property restoration company that covers all of my salary and automobile needs. Without the resume that you put together for me things may have been a little bit different. The resume you provided to me netted me a total of 10 call backs and 8 interviews in a 10 week span. Not too shabby! I would not have been able to get through this challenging time without that resume and for that I thank you. Thanks so much again! Can’t wait to see you next week! Nance is innovative, out-of-the-box thinker, very professional and has excellent knowledge in how to get a person’s creative ideas working. I would recommend Nance very highly! Nance was extremely professional from beginning to end. She came into my life at a time when everything was turned upside down but managed to shift my focus toward a more positive light. Her expertise in resume building, interview coaching and general insight into the job markets was refreshing and genuine. I have and will continue to recommend her services. With seemingly hundreds of career counsellors in the market using a “cooker-cutter” approach, I was thrilled to bits when I connected with Nance, who is a certified Master Career Coach. She invested time to get to know me and used a consultative, collaborative approach to my career planning and job-search process. Through her network of contacts, she knows how the employment market has changed, so you can focus your energies on what is relevant today. Nance’s twenty plus years in personal / professional development as well as her wellness background are major reasons why I choose to work with her. She has wonderful people skills and we have created a true partnership in my job search. 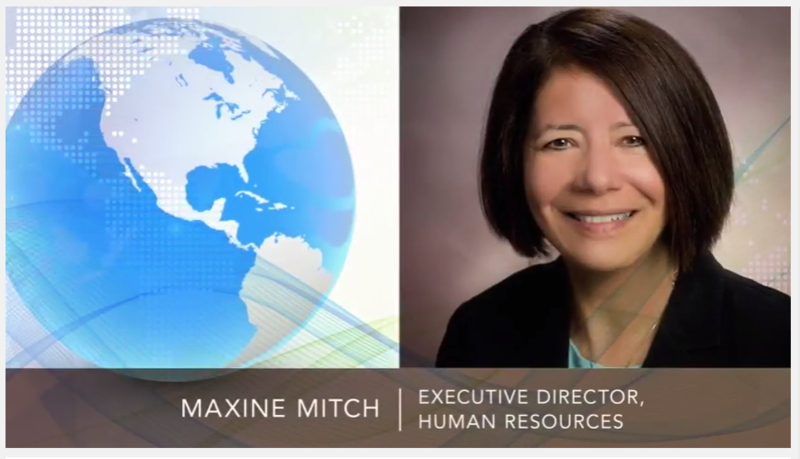 I particular appreciated her holistic approach as she mentored me through the career planning and job search techniques and her willingness to go “above and beyond”. Working with Nance was always a joy and I would strongly recommend her. Nance is an excellent consultant. She is great with people, and makes a professional yet cordial and personal connection early on. She understands her clients and matches her techniques with their needs. Nance, part of the feedback (former employer) I provided was how wonderful I think you are. That you are inspirational, professional, knowledgeable and a wonderful person. I will certainly keep you posted on my progress. I am excited to start this new chapter in my life. Thank you so much for your continued support and kindness. Hello Fred, just wanted to drop you a line to tell you I was offered a position …..
thank you once again for all of your help getting me to this point in my search for employment. “I have had the pleasure of receiving career counselling from Carmela and she is definitely a dynamic force in her area of expertise. Her experience, professionalism and dedication are second to none. Above all, I am impressed with her generous and nurturing guidance that she provides to clients so that they have all the tools and opportunities to achieve a flourishing career. I give Carmela my highest and heartfelt recommendation”. …you are one of the main components of helping obtain this goal. Your patience, confidence and advice guided me to use all the correct tools to finding this position. Thank you again. Paul RW Smith has recommended your work as Certified Career Consultant at Career Compass Canada (Career Partner International affiliate).